Despite a few holes in the software library, the Nintendo SNES Classic Mini offers an enjoyable, accessible and - crucially - affordable way to play some of the most groundbreaking and enjoyable games ever made. It's literally a mini SNES! We've been tinkering with a Nintendo SNES Classic Mini here at T3 Towers for over a month now and, after multiple intense bouts of Street Fighter II Turbo: Hyper Fighting, countless laps on Super Mario Kart, and many hours sunk into single-player epics like Super Metroid and Secret of Mana, we definitely feel that we have a feel for the new, micro system. Here we reveal our feelings towards Nintendo's Super NES Classic Edition, talking about the package and hardware, games and interface, as well as the differences between import editions. If you are looking for the best Nintendo SNES Classic Mini deals, however, then head on over to our dedicated pre-order information hub. To kick off though, check out our Nintendo SNES Classic Mini unboxing video to get a feel for what you get in the package. Included with the Nintendo Classic Mini: Super Nintendo Entertainment System console are a HDMI cable, a USB power cable, and two wired Super NES Classic Controllers – perfect for players to dive into multiplayer action right away (the NES Mini only came with one). The controllers, rather than connecting via scaled-down SNES controller ports, in fact have the same connector as the NES Mini and connect to ports located behind the fake SNES ones. The console is roughly a quarter of the size of the original SNES, features functional power and reset buttons, and is identical in design asides from the lack of functioning cart slot and eject button. Naturally, the rear power and audio-visual connectors of the original console have also been replaced with the modern upgrades (Micro USB to USB for power and HDMI for audio and video). In what will be music to retro gamers' ears throughout the land, the SNES Classic Mini controllers look and feel identical to the original system's. The only difference is the length of the controller chord, which thankfully is much longer than the too short NES Mini Classic's, and the chord's connector head. Unlike the numerous cheap, imitation SNES controllers that have flooded the market over the last 10 years or so, the pair that you get with console feel absolutely spot on, with the BigN clearly identifying it as a no-compromise part of the overall package. What is this? A console for ants! So what games do you get with the SNES Classic Mini? See below - the console comes with 21 titles that are hard-coded into the system, but we're guessing that can likely be hacked akin to what happened with the NES Classic to cram more in if you want to play fast and loose with the warranty. Most of the old classics you remember from the '90s are in there, as well as Star Fox 2 - a title that was not officially released previously. We've got to admit that a finished, polished addition of Star Fox 2 was a welcome boon, as it offers something genuinely new to the Super NES Classic Edition. And when we say classics, we mean classics, with legendary titles such as Super Mario Kart, Contra III: The Alien Wars, F-ZERO, Mega Man X, Street Fighter II Turbo: Hyper FIghting, Super Metroid, The Legend of Zelda: A Link to the Past, Super Mario World, Donkey Kong Country, Final Fantasy II and more available to play. And while the majority of the games are single player, some of the included games come with multiplayer options, including Street Fighter II Turbo: Hyper Fighting, Super Mario Kart, Contra III: The Alien Wars and Secret of Mana. Accessing the games is incredibly easy as well, with the same scrolling, box-art filled gallery system used as on the NES Classic Mini. In fact, the whole menu system runs exactly the same way, with visual options like the addition of scan lines easily turned on and off. Now it's important to mention again here that depending on which territory's system you pick up (Europe, America or Japan - see below for more details) will see you getting one of multiple different game lineups, with a majority core remaining the same and then some outliers differing. Here at T3 Towers we tested out a European version and we were happy with the selection overall (see below for full list), however, we would be lying if we said we didn't think there were some top titles that we would have loved to have seen included over others. Trust us when we say this as serious Super Famicom and SNES collectors ourselves here at T3 Towers, there is a hell of lot of gaming in that list. Secret of Mana, Final Fantasy III, EarthBound and Super Mario RPG: Legend of the Seven Stars are massive role-playing games that will take players dozens of hours to complete, while all out action hits like Contra, Star Fox, Super Mario World, Mega Man X and more are incredibly repayable. Simply put, you are definitely getting value for money. The inclusion of the never-before-released Star Fox 2 will also offer something a little recherché for Nintendo fans, with the never officially released title now completed and delivered for play in all its glory (players must prove their skill by completing the first level of the original Star Fox before Star Fox 2 is unlocked to play too). An American edition and Japanese edition of the Nintendo SNES Classic Mini are also available through certain online importers. 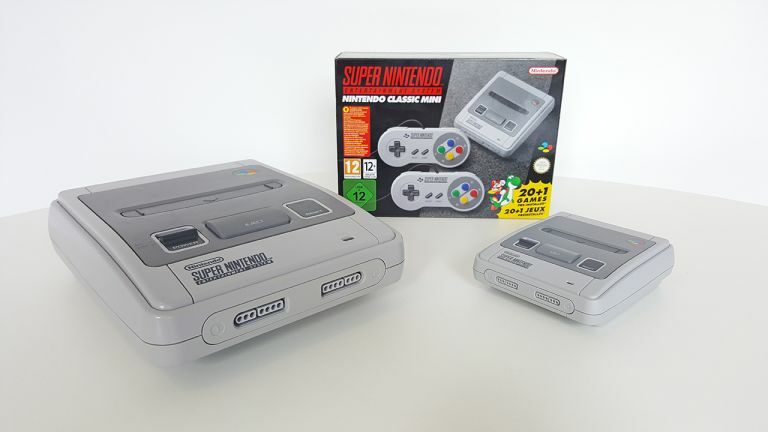 The American edition of the console is called the SNES Classic and, while rocking the same games line-up as the European edition, has a different physical design, replicating the chunkier American-edition of the classic console. Key differences in the lineup between the Nintendo Classic Mini Super Famicom and the Nintendo SNES Classic Mini include the introduction of Legend of the Mystical Ninja (Ganbare Goemon: Yukihime Kyūshutsu Emaki), Panel de Pon, Super Formation Soccer (aka Super Soccer), and Fire Emblem: Mystery of the Emblem. Our take-away from our time with the Nintendo SNES Classic Mini is that it successfully repackages much of what made the original Super Nintendo Entertainment System such a hit. The hardware is mostly spot on, the games largely top tier and varied in genre, and the accessibility taken through the roof, with a simple plug-and-play console that costs a fraction of what it would take to build a similar library of original carts running on original hardware. Whether or not it can transcend gimmick into a piece of technology that retro gamers will use long-term, or even substantial enough to consign their original SNES to the attic, is something that will only become evident over the next six months.